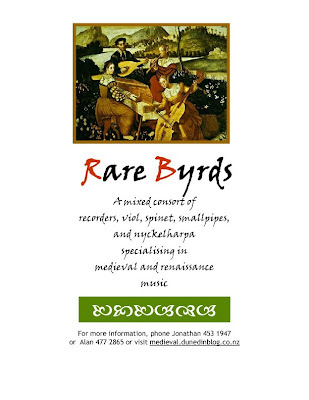 The Rare Byrds first performance is at 1.30pm, Sunday 12 April in the Otago Museum atrium as part of the Museum's Passionate About Performance series. The concert is free and will feature a range of early music including works by Zanetti, Tomkins, Dowland, Byrd and Purcell. All welcome. Rare Byrds are happy for contact from other interested instrumentalists or singers.